The duo Aspec(t) is electronic noise artist SEC_ on Revox tape recorder and Mario Gabola on saxophone and DIY feedback systems. They have been touring extensively through Europe and organized hundreds of show in thier home town of Napoli. Aspec(t) has released several albums and two collaboration albums, one with Dave Phillips and one with Andrzej Zaleski. Andrea Pensado works with sound as a performer and programer. She has been using digital media and live interactive musical systems since 1995. She studied in Argentina and Poland. At first, she composed mainly for acoustic instruments. However, she felt gradually more attracted by different sound realms. Today, the abrasive digital noise of her improvisations is far away from her earlier pieces. Harsh dense layers of sounds, often interwoven with her voice, combine hybrid synthesis techniques to create a highly personal sound language, which reflects an intuitive, emotional and paradoxically also logical approach to music making. She currently lives in the US. 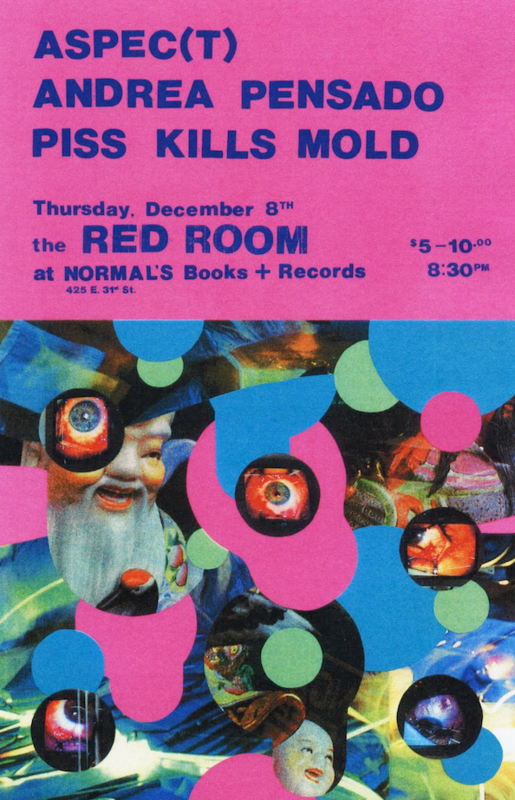 Piss Kills Mold is Jimmy Joe Roche’s solo noise project. He will be performing on modular synth and Cocoquantus. Roche runs the Baltimore based Cassette Label Ultraviolet Light.